Pollination syndromes are suites of flower traits that have evolved over time in response to the pressures of natural selection imposed by the vectors of pollen. Pollen vectors can be abiotic (wind, water) or biotic (animals). The traits comprising a syndrome can include the size, shape, color, and odor of a flower. Also, the time of day or night the flower is opened and the type and amount of reward offered are crucial. 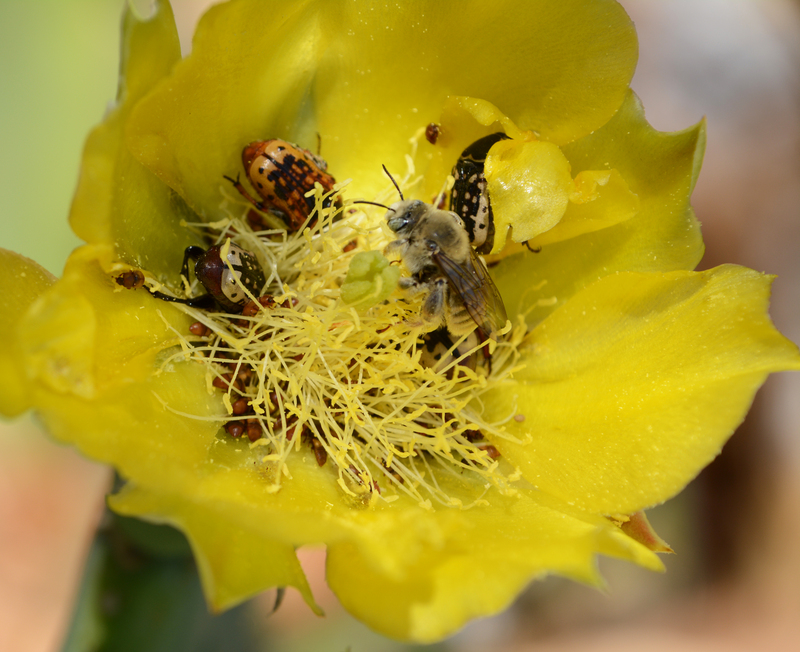 The rewards given to pollinators (usually nectar and/or pollen) may be a costly commodity for a plant to produce. So plants have evolved to obtain the greatest amount of pollen transfer for a minimum reward to a pollinator. Different types of pollinators have varying degrees of efficiency of pollen transfer based on their size, anatomical shapes, and behaviors; and the traits of a flower will have an effect on the efficiency of the transfer of pollen as well. To efficiently transfer pollen, it is often best for a plant to be a specialist with the pollinator focused on a single plant species. This reduces the chances of wasting pollen from a pollinator depositing it on the stigmas of the incorrect plant species. But pollinators fluctuate in their abundance and activity independently of a plant, and any one pollinator species may fail to accomplish pollination in a particular year. Conversely, a plant may have an advantage by being a generalist and attracting several species or types of pollinators, thus ensuring pollination every year. Beetles were among the earliest pollinators of flowering plants going back 200 MYA into the Mesozoic Era. Due to the numbers of species involved, beetles are the largest group of animal pollinators. Beetle pollination, or cantharophily, accounts for the pollination of about 88% of flowering plant species. Beetles eat their way through floral parts and even defecate within the flower, earning them the nickname of “mess and soil” pollinators. In general, flowers pollinated by beetles are usually solitary and robust, although some flowers occur in clusters of small flowers. Beetle flowers are often flat to dish-shaped, with pollen easily accessible. The flowers may be white to off-white, yellow, or greenish. Sometimes, beetle flowers are heavily scented of spice, fruit, or decaying organic material, but often they have little scent. Beetle flowers are open during the day and produce moderate amounts of nectar. 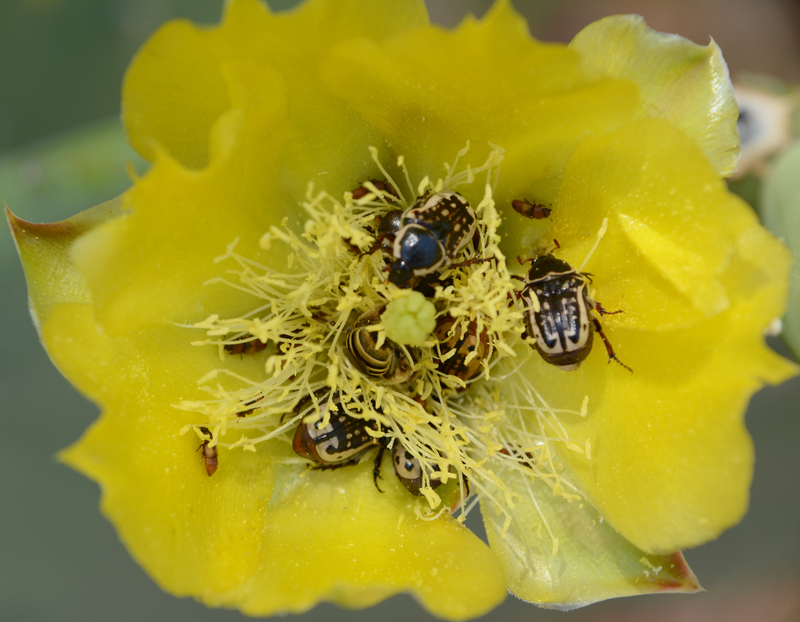 Beetles are of particular importance in the pollination of flowers in semi-arid areas.